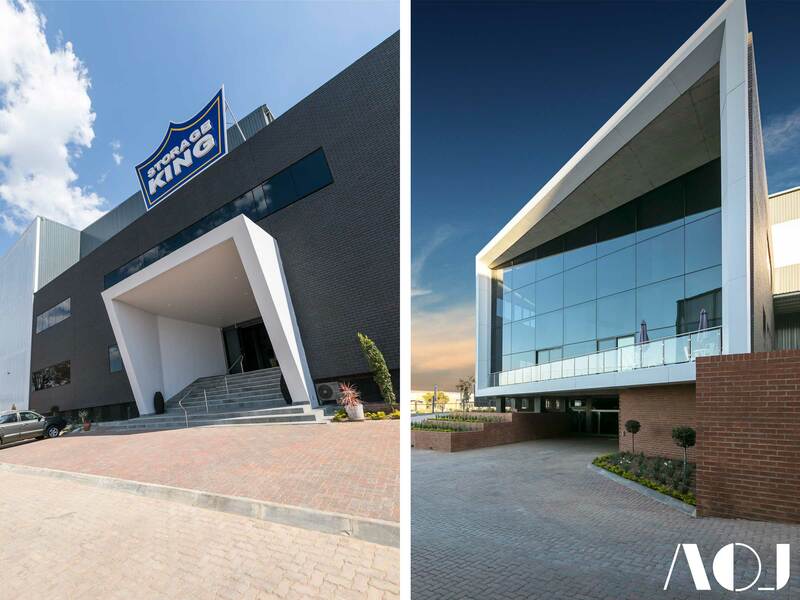 The building in question is Storage King’s new head office, comprising 10 800 square metres under roof, and despite Granicki’s oversimplified description, the building is actually an incredible vision brought to life by a dedicated professional team aligned to the project. Notably, the building also features the largest black brick façade attempted to date. 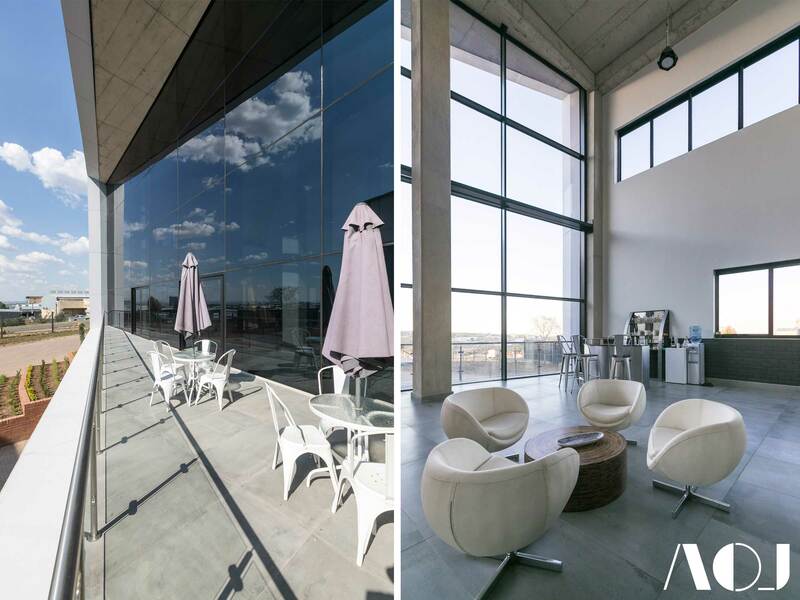 Granicki explains that the overall design of the building was dictated by form and proportion and that it was a requirement by the client and tenant for the building to attract attention. An extremely large angled glass façade and a playful entrance balance the otherwise stark and striking brick elevation. “Under the directive of the client, we designed a sleek building with minimal difficulty – a developer’s dream,” notes Granicki. 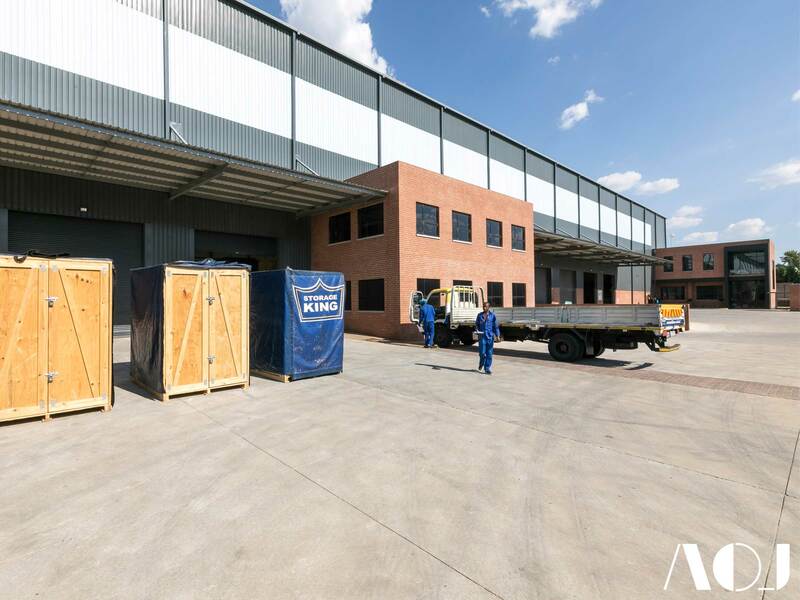 “It is essentially a double storey office on a basement attached to a large warehouse.” The offices are 550 sqm and the office component is shifted off the end of the warehouse to extend the Malibongwe façade and reveal a translucent end to the warehouse which is primed for a digital display. 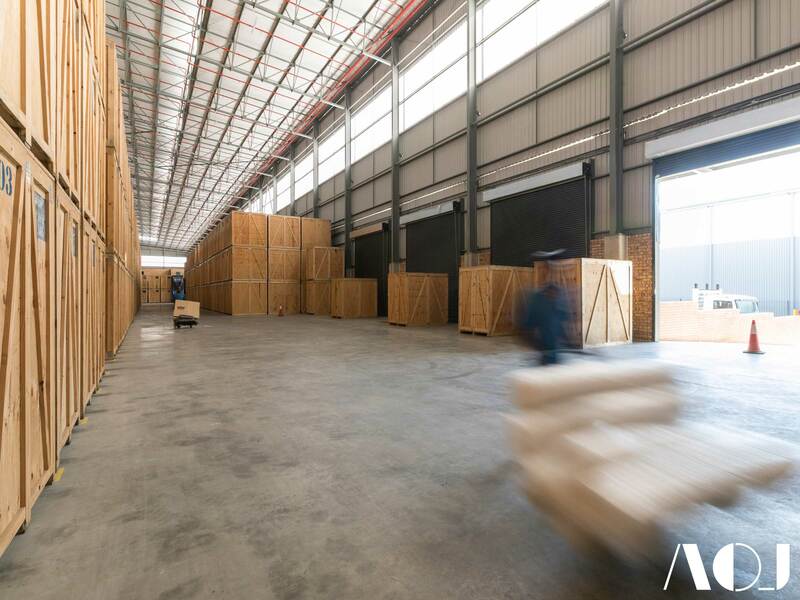 The warehouse is designed for high level racking and supersedes the tenant’s current needs, while the height of the warehouse pushed the office section several courses higher than is typically seen in industrial parks. Internally, the notion of ‘selling space’ was the driver of the design. “When clients enter, they need to feel as if their belongings are going to be safe, secure, watertight and accessible,” says Granicki. 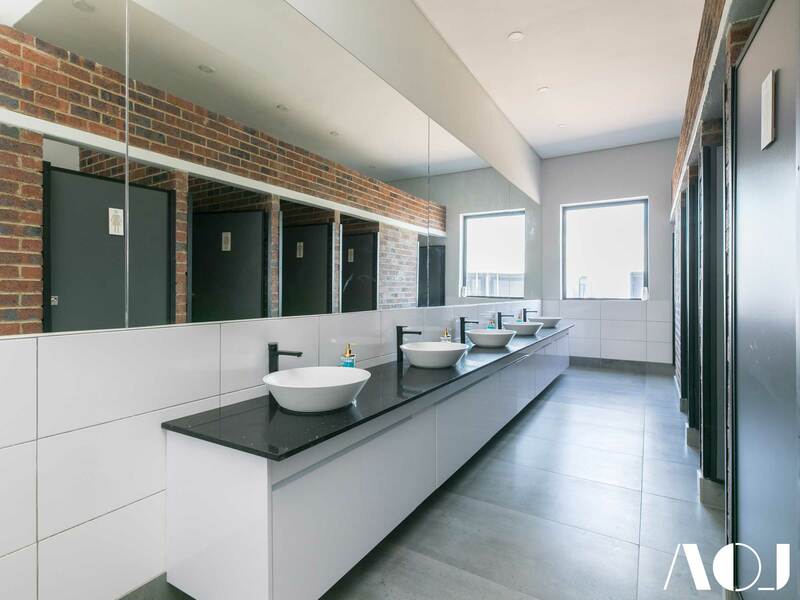 “We managed to deliver a facility which meets all those functions and beyond.” A monochromatic palette with lots of black, grey and white is utilised in conjunction with high gloss materials, while large floor tiles – 1200mm x 600mm – reinforce the idea space. 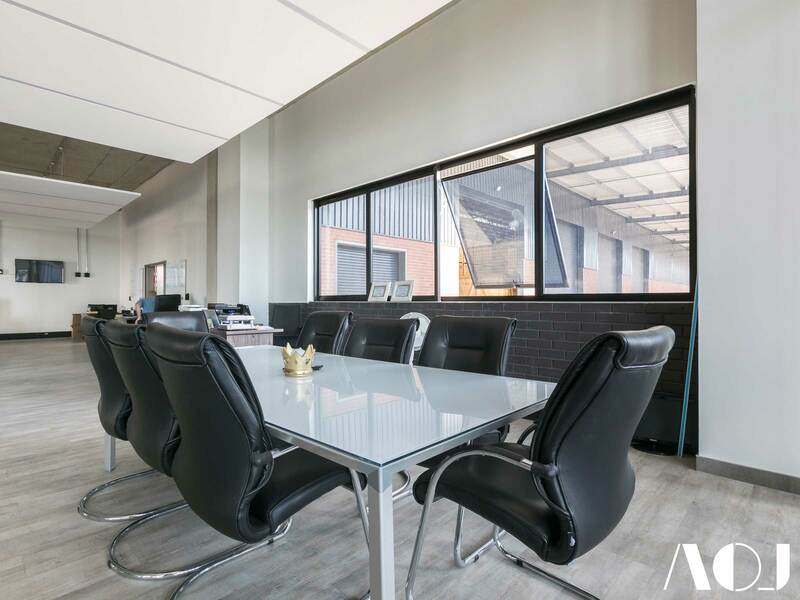 A no-nonsense, raw, industrial chic look is predominant in the office space with exposed ceilings and services punctuated by glass partitions and hanging bulkheads at the work areas. 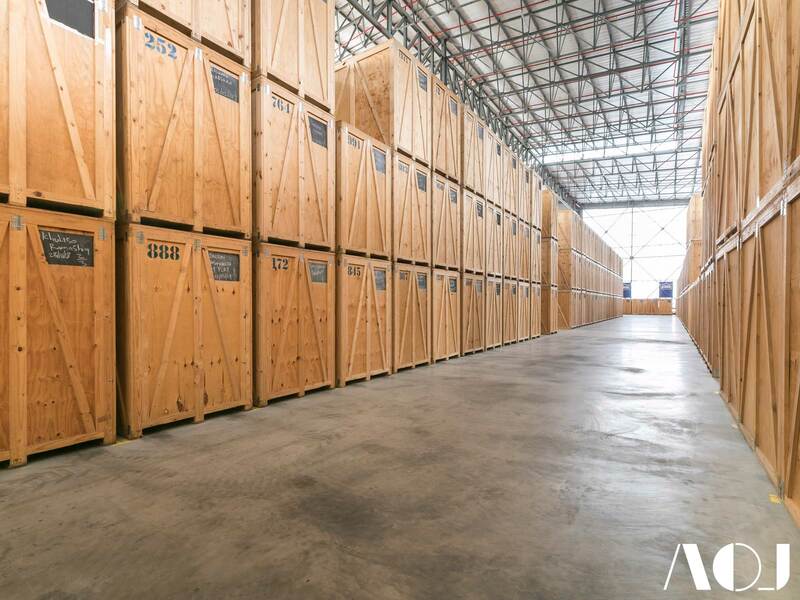 “One aspect which we identified early on is that the salespeople answer the same questions all the time, such as; how much does it cost, how much space, and when can I access the storage?” explains Granicki. In the large volume space of the entrance lobby, AOJ have therefore hung a storage container, with a lit up info-graphic so that the building can perform a portion of the sales function for the client. “This was a case of architecture and the business merging, so understanding their business was essential. If we can save each salesperson five minutes per customer, over the lifetime of the business, we are saving an incredible amount of time,” he says. 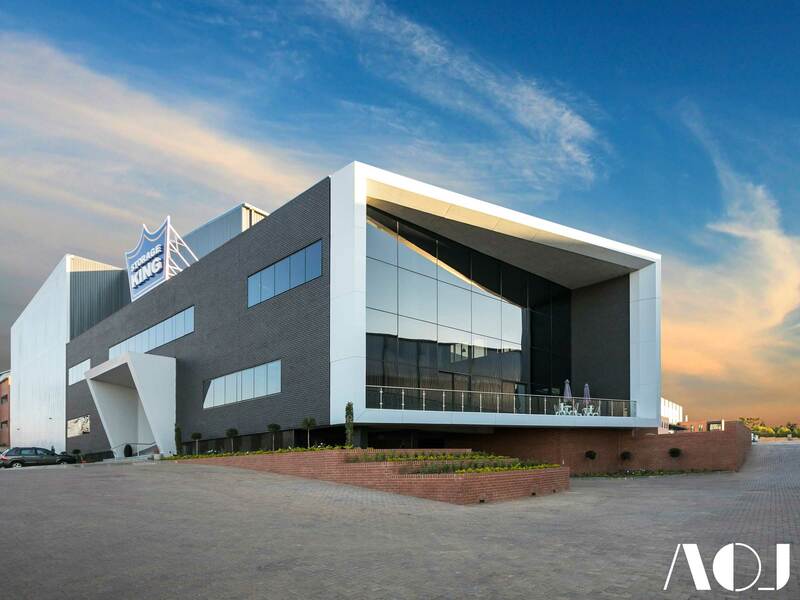 The offices feature the largest black brick façade attempted to date, and as Granicki notes, the intention is to illuminate the facade which will give the client an opportunity to brand the company in a number of ways, including the possibility of animation. 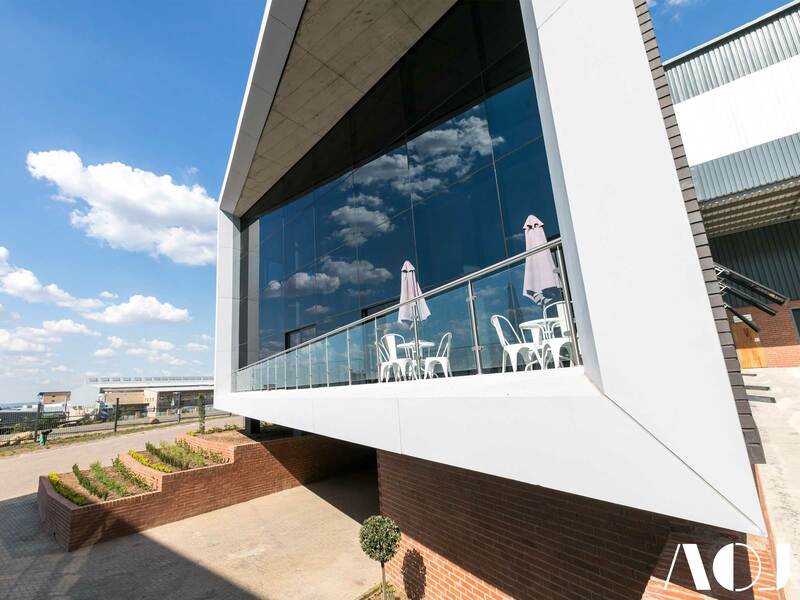 “Early in the project, the developers, Orpen Group, suggested using face brick as they have experience with the long-term benefits regarding maintenance on their existing face brick buildings. Thus, from the design concept we knew that these would be industrial building and that brick would be the best option,” says Granicki. Fabiano Cellini from the Orpen Group notes that the eye-catching black brick was chosen because of it originality in the market. 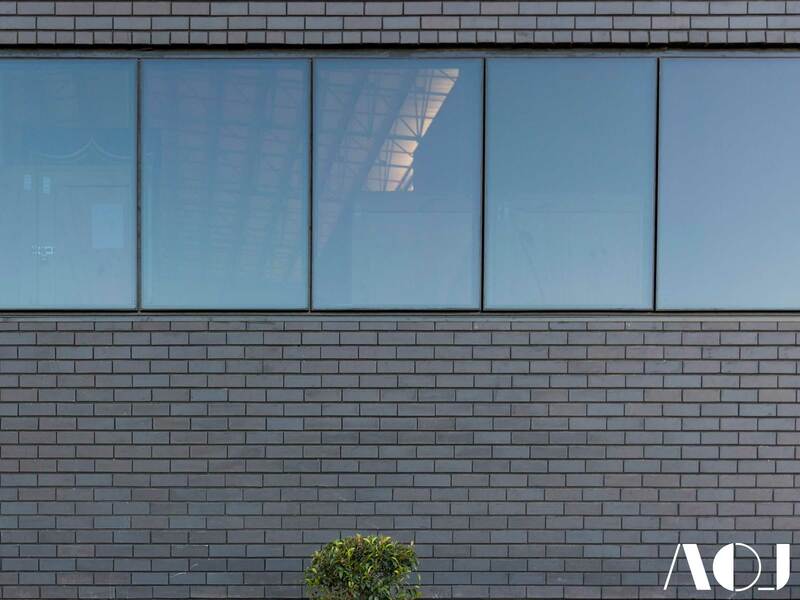 “We wanted to create something new with face brick, therefore, to keep the shadow lines and maintain the darkness of the façade, a decisions was made to use tile adhesive as the mortar. From a developer’s point-of-view, face brick was selected because of the timelessness of brick, low maintenance and skills development in the local community. Granicki explains that in order to have a striking façade that would be built correctly (remedial work would be too expensive given the mortar and brick), the architects simplified the brick bonds and let the material do its own talking. “The contractors did a great job with the installation and no rectification was required. 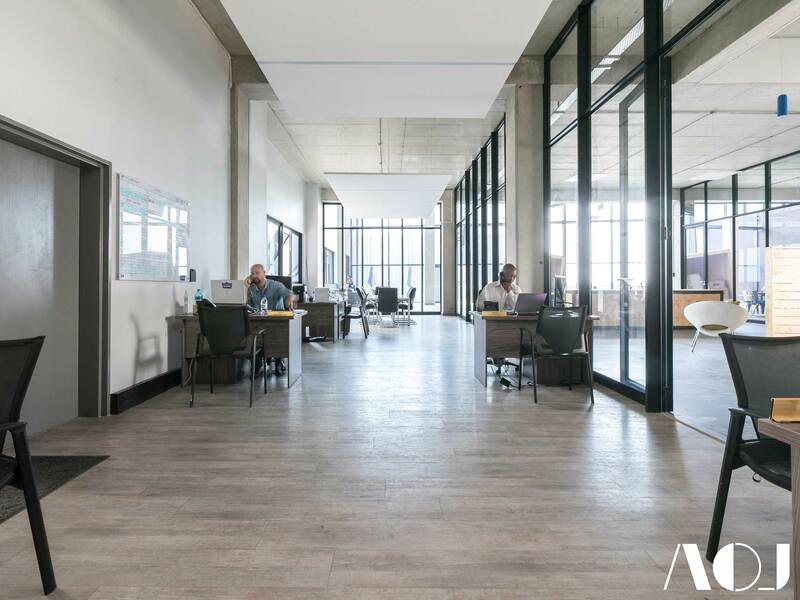 The office building is incredibly simple yet striking.” From a sustainability perspective, insulation inside the brick cavity walls helped meet the buildings energy standards. A total of 40 000 bricks were used in the façade, while 180 000 were used for the warehouse walls. “Essentially Storage King is a well orientated building, built by a great team with a well-defined plan,” concludes Granicki. “For me, architecturally, the most difficult thing to get around was how sentimental people are about material objects. 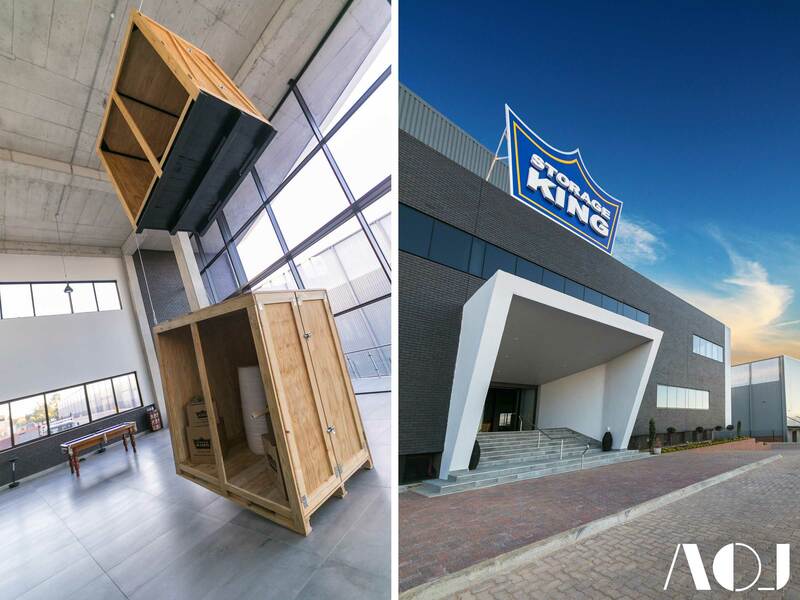 It was an interesting project, and once we got to understand the user and how best to provide for their needs, we were able to design a facility which caters for not just their basic needs, but all the possible needs which a storage facility should, and can provide.” The Storage King head office and warehouse is a physical manifestation, brought to life by the architects, of what such a facility such as this can offer users.